The Winnipeg Blue Bombers quest to end their long playoff drought will begin against the B.C. Lions next Sunday in Lotusland. The Bombers did their part in an effort to land a home playoff date with a win over the Ottawa REDBLACKS Friday night, but got no help from the Saskatchewan Roughriders as they were mauled by the Lions 41-18 at B.C. Place on Saturday. 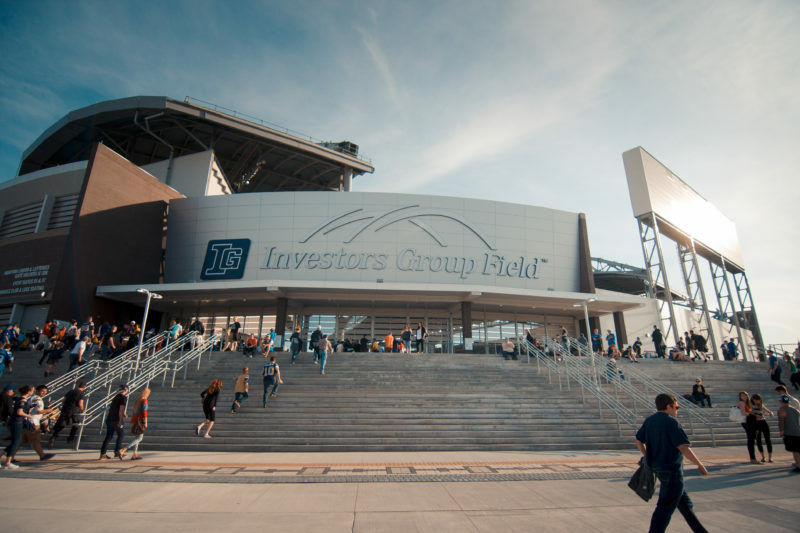 As a result, Winnipeg finishes third in the Canadian Football League’s West Division at 11-7 and will face the second place Lions, 12-6, in Vancouver in the divisional semi-final (3:30 p.m. CT). It’s the Bombers’ first appearance in the playoffs since losing to the Lions in the 2011 Grey Cup. The Bombers were 2-0 against B.C. this year, winning 37-35 a month ago in Winnipeg and then rallying from 10 points down for a 35-32 victory at B.C. Place on Oct. 14th. “Our run (seven-game win streak) started after a loss to Calgary and ended with a last-second field goal in Calgary. 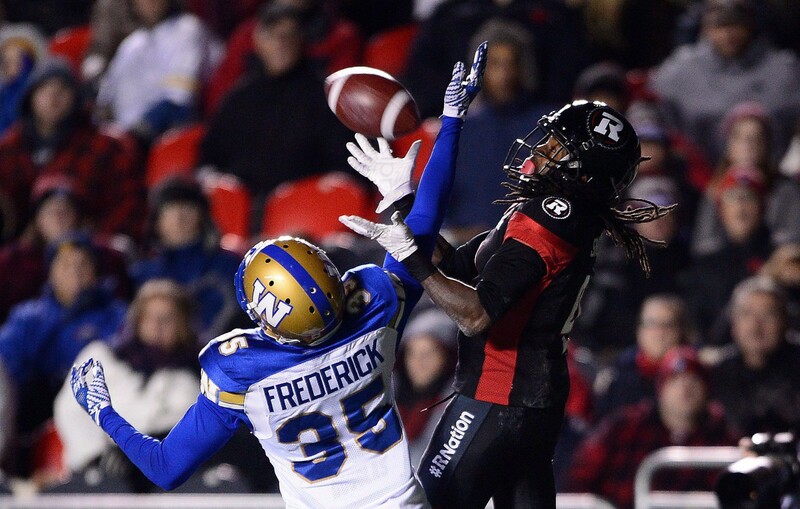 We want to see those guys again,” said Bombers linebacker Maurice Leggett. The Bombers went 10-3 after a 1-4 start to the season and their 7-2 road record was the best in the CFL this year. The Lions finished the regular season 6-3 at home and, after dropping those back-to-back contests with the Bombers, enter the playoffs on a three-game win streak. Now, while there was a very vocal sense of euphoria after the win in Ottawa, this bunch won’t take a ‘just-happy-to-be-here’ approach into the playoffs. They’ve beaten every team in the league but Calgary this year and to get another shot at the heavy Grey Cup favourites, they’ll have to clean up some of the sloppiness that has popped in their game over the last few weeks and then beat a Lions team absolutely stacked with offensive weapons. “This takes me back to the journey we’ve been on,” said cornerback Chris Randle. “I’ve been here with this regime since it came in and appreciate it because of all the work we’ve done to get here. There’s a cohesiveness with this team. There’s no quit and there’s this supreme belief. I really think that’s what makes this team special. 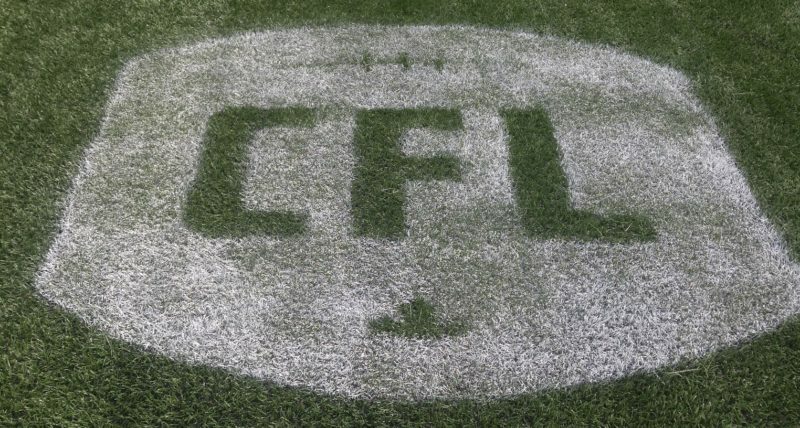 The only silver lining from Saturday’s results for the Bombers actually came in Edmonton, where the Eskimos knocked off the Toronto Argonauts. That result means the Argos will finish 5-13 and last and, because of the Drew Willy trade with Toronto in September, Winnipeg will now hold the first overall pick in the 2017 CFL Draft. JUSTIN MEDLOCK MADE HISTORY… Friday night by kicking four field goals to get to 60 on the year, breaking the CFL record of 59 set by Dave Ridgway in 1990. He didn’t have an attempt in the first quarter before hitting from 20 and 15 yards before halftime, from 10 yards in the third, and then a 12 yarder with less than three minutes left in the game. Just FYI, Medlock started the year going 8-for-12 (66.7 per cent), and finished the year going 60 of 68 (88.2). In other words, he went 52 of 56 (92.9 per cent) after his slow start. One more stat worth pointing out: his eight misses this year were from 47, 51, 50, 49, 44, 49, 48 and 58 yards – an average length of 49.5 yards. MEDLOCK’S NUMBERS HAVE PROMPTED A LOT OF CHATTER… all season about the Bombers productivity and what the numbers represent. The short kicks do speak of not finishing in the red zone but – from this perch – 60 field goals shouldn’t be a condemnation of an offence. First and foremost, Medlock’s handiwork was major in the Bombers posting an 11-7 record. And the subject came up with the kicker afterward. Let’s examine that further. 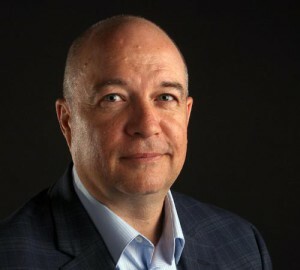 Of the six highest field-goal totals in CFL history, none of those teams had a losing record and one – the Baltimore Stallions of 1995 – captured the Grey Cup (with the Bombers and Stamps having a shot at a title later this month.) Those six teams also have a combined record of 72-35-1. BIG FINISH TO THE REGULAR SEASON FOR DARVIN ADAMS… who returned from 10 games on the injured list and put up gaudy numbers in the final two weeks. Adams had six catches for 100 yards and two TDs Friday night and 15 for 187 yards and three TDs in the last two games. Adams posted three 100-yard efforts in his last four games and, in just eight contests this year, had 51 catches for 690 yards and six scores. “There’s a lot of good guys around me which makes it easier,” Adams said. “It’s not like all the focus is on me. They’ve got to guard Weston, Tori Gurley, Rory, Andrew Harris… there’s a lot of guys they have to account for so that makes it easier on me. ANOTHER GUY WHO PUT UP JUICY NUMBERS… despite missing four games, was Weston Dressler. 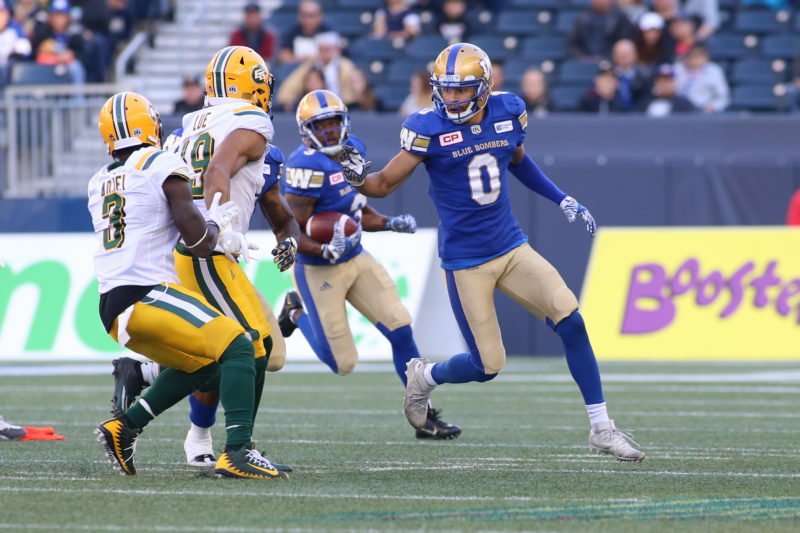 In case you missed it, Dressler hit the 1,000-yard mark for the sixth time in his nine-year career, finishing with 80 receptions for 1,003 yards. Dressler and Nichols do have that coveted QB-receiver rapport and it starts, the veteran pass catcher insists, in the homework they do off the field. NICHOLS, BY THE WAY, TOOK SOME LICKS… in the win over Ottawa, but emerged healthy. Well, as healthy as a guy can be in early November. The Bomber QB also admitted post-game that it was difficult not to look ahead to next week’s West Semi-final while facing an Ottawa squad that was essentially dressing a preseason roster. AND, FINALLY, IT’S HARD NOT TO CHEER FOR A GUY LIKE… Padric Scott, who dressed for his first game Friday night after spending the whole season on the practice roster. There was a lot of emotion in the Bombers locker room after the game as the club soaked up the victory and an 11-win season. Scott was part of that post-game celebration, but when we found him at his locker in the corner he was in a reflective mood. An engaging sort who is popular in the room, he had a lot of teammates – and his head coach – rooting for him because they appreciate what he brought to work every day. Scott finished the night with a tackle, a sack and a forced fumble. Scott played in the Bombers preseason game in Ottawa in June, but last played a ‘real’ game in March with the Tampa Storm of the Arena League. He had a tryout with the Toronto Argonauts in 2014 after a stint with the Arizona Cardinals in 2013, but had been getting his football fix in the Arena league with the Storm and Philadelphia Soul. “It’s been awhile. There’s no substitute for being out there,” said Scott. “Coach O’Shea always tells us to buy in and come to work because everybody plays a role. For me, I just practiced every day like I was playing on Saturday – even though I wasn’t. I just always tried to prepare like it was going to be my turn and it was finally my turn and so to be able to out there and get a sack and forced fumble… that’s tough to put into words. I’m humbled by the experience and so happy.